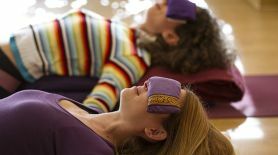 Restorative yoga uses gravity and other forms of support (walls, cushions, chairs blocks) to create gentle passive openings in the tissues and achieve relaxation in the entire neuro-muscular system of the body. Maintaining restorative postures releases, hydrates and revitalizes fascia and other connective tissues in the body. It allows those areas of the body that tend to accumulate stress, to gradually soften the resistance and surrender to gravity. This process calms the nervous system relatively quickly, but when performed with regularity, it becomes "imprinted" as a new habit of releasing stress at will. Gradually, this practice can lead to the prevention of future accumulation of tension in the muscles, fascia and the organ system. - How to use different restorative postures to tackle issues such as anxiety, insomnia, depression, chronic fatigue, difficulty in breathing, and shoulder and back pain. - How to consciously release tension from the muscles and organs and with the help of interoception. Recognizing the early signs of stress building up helps us address it before it escalates to a level that is difficult to manage. - Sensit Yoga Methodology - the embodied experience of the teacher in practice. Guiding the awareness to relax the muscles, fascia and the organs. - Basic types of meditation for beginner students. The common obstacles, myths about meditation, and ways to integrate meditation in every class. Helping students acquire a consistent meditation practice at home.